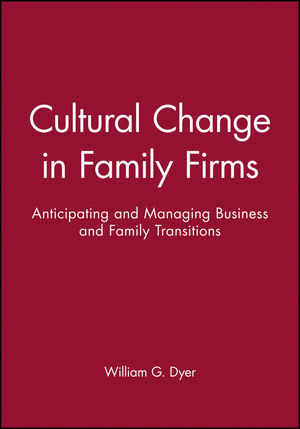 Explains how to recognize, anticipate, and solve the problems created by the cultures of family firms as they grow and mature. Shows how culture can determine the success or failure of the firm based on comparative case studies of a wide range of successful and unsuccessful firmsincluding small businesses, new and well-estalbished firms, and such large corporations as Du Pont and Levi Strauss. W. Gibb Dyer is the O. Leslie Stone Professor of Entrepreneurship in the Marriott School of Management at Brigham Young University. Dyer is a recognized authority on family business and entrepreneurship. He has been featured in numerous publications including The Wall Street Journal, Inc., The New York Times, and Nation's Business.